6' 8" x 7' 4"
This stunning antique Bidjar kilim is a symphony in red, blue, brown, gold, and ivory. The order of the various vertical bands has a dynamic rippling effect, but beneath this apparent motion is a strict and precise plan. Each band is flanked or reinforced by thin stripes in a complementary color, while the red and blue bands are consistently paired. An ivory band separates the brown bands from the paired red and blue ones, and this constant rhythm is scrupulously maintained throughout the design. 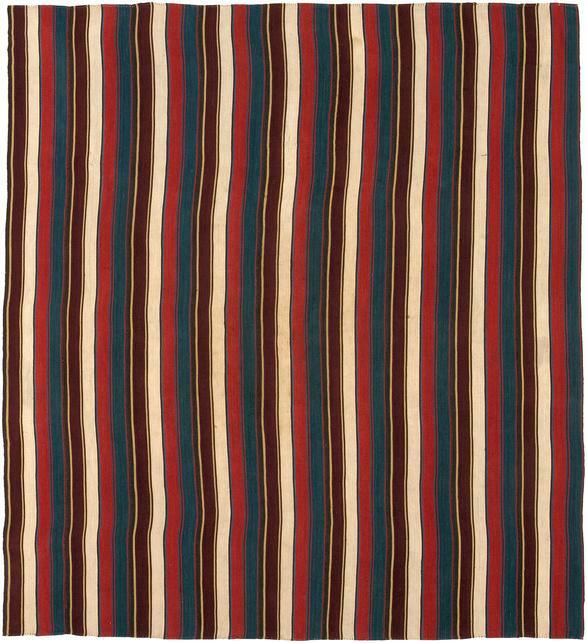 This kilim is exceptional for the range of its colors and the complexity of its pattern. Its weave is also exceptionally fine, with a lustrous surface that enhances the rich color effects.